Please read these terms and conditions carefully. By accessing this site and any pages thereof, you agree to be bound by the terms and conditions below, in addition to terms applicable to Auto Card Loyalty Program. Usage of any Maruti Web Site indicates unconditional acceptance of these terms. You warrant that you are competent to contract as per Indian Contract Act, 1872 in accordance with all terms and conditions of booking, sale and delivery of vehicle(s) manufactured and marketed by Maruti Suzuki India Limited (hereinafter referred to as "MSIL"). 2 Copyright© Maruti Suzuki India limited 2017. Copyright in the pages and in the screens displaying the pages, in the information and material therein and in their arrangement, is owned by MSIL unless otherwise indicated. 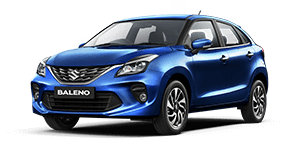 Maruti Suzuki used severally or in conjunction with SUZUKI or other mark(s), Wing device, S device, model names and other marks developed by MSIL in relation to services are marks and service marks owned by MSIL and Suzuki Motor Corporation, Japan. The information and materials contained in these pages, and the terms, conditions, and descriptions that appear, are subject to change. Unauthorized use of MSIL's web sites and systems including but not limited to unauthorized entry into MSIL's systems, misuse of passwords, or misuse of any information posted on a site is strictly prohibited. Not all products and services are available in all geographic areas. Your eligibility for particular products and services is subject to final determination by MSIL and/or its affiliates. The information and materials contained in this site, including text, graphics, links or other items are provided "as is", "as available". MSIL does not warrant the accuracy, adequacy or completeness of this information and materials and expressly disclaims liability for errors or omissions in this information and materials. No warranty of any kind, implied, expressed or statutory including but not limited to the warranties of non-infringement of third party rights, title, merchantability, fitness for a particular purpose and freedom from computer virus, is given in conjunction with the information and materials. In no event will MSIL be liable for any damages, including without limitation direct or indirect, special, incidental, or consequential damages, losses or expenses arising in connection with this site or any linked site or use thereof or inability to use by any party, or in connection with any failure of performance, error, omission, interruption, defect, delay in operation or transmission, computer virus or line or system failure, even if MSIL, or representatives thereof, are advised of the possibility of such damages, losses or expenses. All information submitted to MSIL via this site shall be deemed and remain the property of MSIL and MSIL shall be free to use, for any purpose, any idea, concepts, know-how or techniques contained in information a visitor to this site provides MSIL through this site. MSIL shall not be subject to any obligations of confidentiality regarding submitted information except as agreed by the MSIL entity having the direct customer relationship or as otherwise specifically agreed or required by law. Nothing contained herein shall be construed as limiting or reducing MSIL's responsibilities and obligations to customers in accordance with the MSIL privacy promise for consumers. Maruti Suzuki reserves the right, in its sole discretion, to terminate your access to any or all Maruti Suzuki Web Sites and the related services or any portion thereof at any time, without notice. 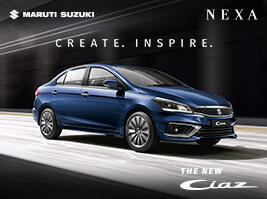 Maruti Suzuki reserves the right to change the terms, conditions, and notices under which the Maruti Suzuki Web Sites are offered, including but not limited to the charges associated with the use of the Maruti Suzuki Web Sites. You are responsible for regularly reviewing these terms and conditions. Use of this site shall be governed by all applicable laws, rules and regulations of the Union of India, its States and Union Territories. “Customer” means a prospective customer interested in online booking of NEXA Models from an authorized NEXA Dealer of MSIL and includes any Individual/ Firm/ Proprietorship/ Company or other legal entity. In the event that the Customer is booking on behalf of another person, the necessary details of such other person is also required to be mentioned and the requisite details of such other person are required to be produced at the Authorized NEXA Dealership as per requirement by the Authorized NEXA Dealer. In the event that the Customer wants to make a booking of more than one vehicle, the booking process is required to be repeated. In other words, one vehicle can be booked per booking. The online booking facility is for the convenience of the customers. The details of the Customer as provided by the Customer shall be used by MSIL and its Authorized NEXA Dealers for all correspondences with the Customer. 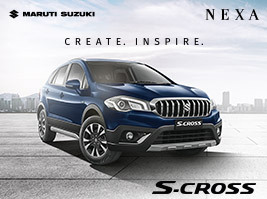 Booking is allowed only with the authorized NEXA Dealers of MSIL as mentioned on this NEXA Website. The Customer is requested to thoroughly read and understand updated specifications, features of NEXA MODELS posted on the official NEXA website before making their choice. The choice of variants of the NEXA models would be updated on the NEXA Website from time to time and shall be subject to availability at the selected Authorized NEXA Dealership. The price of the vehicle shall be as applicable on the date of invoicing of the vehicle. The prices are subject to change and we are not responsible / legally bound to inform you in advance. All formalities with respect to purchase of NEXA MODELS, including but not limited to the registration process shall be performed at the respective Authorized NEXA Dealership. The sale and delivery of NEXA MODELS shall be subject to fulfillment of all applicable statutory obligations and submission of requisite supporting documents. The originals of these documents will need to be produced at the Authorized NEXA Dealership. In the event of the Customers failure to ensure compliance of these requirements, the booking amount paid by the Customer is liable to be forfeited. MSIL shall not be responsible for the collection of booking amount or entire payment for NEXA MODELS. The Collection of payment and the delivery of NEXA MODELS shall be the responsibility of the Authorized NEXA Dealer. All parties shall ensure the compliance of the applicable provisions of the Information Technology Act, 2000 and its allied rules as amended from time to time. We assume that you have read all terms and conditions before going ahead with online booking. Acceptance of online booking payment is taken on behalf of the Authorized NEXA Dealer by a payment gateway. The online booking engine is available at “www.Nexaexperience.com” whereas payment gateway is powered by the Intermediary providing payment gateway and merchant services. Payments made by the Customer for online booking of NEXA MODELS through payment gateway IMS are subject to the terms and conditions as provided by the payment gateway intermediary/ merchant service provider. MSIL or its Authorized NEXA Dealers would not be responsible for any non-payment or wrong payment made in respect of the booking through the payment gateway. The Booking amount for NEXA MODELS will be displayed on “www.Nexaexperience.com”.You cannot pay more or less than the mentioned amount for online booking of NEXA Models. The Booking Amount can be paid online using Debit Card/ Credit Card/ Internet Banking. Processing fees for booking amount paid by the Customer will be borne by the Authorized NEXA Dealer. The Customer needs to provide accurate and complete information while filling the form online. After online submission of the form and the valid online payment transaction, the system will generate a Payment Confirmation Reference Number and receipt of payment towards the booking amount. The Customer shall use the reference number and receipt to communicate with the Authorized NEXA Dealer. The booking shall be binding only after the receipt of the full balance price of NEXA MODELS and submission of requisite supporting documents. Until then, the online booking is merely a request on part of the Customer and an indication of an intention to sell on the part of the Authorized NEXA Dealer and does not result in a booking confirmation or contract of sale and does not impose financial implications on MSIL or the Authorized NEXA Dealer except as provided herein in these terms and conditions. MSIL retains the right to revise the specification, standard fitment and/or accessories of/for NEXA MODELS or introduce new variants or their versions or discontinue earlier variants or versions. The waiting period and the expected delivery date shall be communicated by the Authorized NEXA Dealer. The Customer is required to follow the cancellation/refund procedure as mentioned herein. Cancelation request, if any, should be placed by the customer online in case of online bookings. Please note that there will be no offline cancelations at the Authorized NEXA Dealership for online bookings. There will be no booking cancellation charges if the customer cancels the booking. The online booking amount shall be refunded to the Customer through the same mode that used for making the payment for booking. It takes 25-30 days* for the amount to get refunded. No cash payments would be made by the Authorized NEXA Dealership to the Customers. * The refund, once processed from NEXA Dealer (acquirer/acquiring bank) end, is credited to the pool account of the issuer bank. The actual credit posted to the cardholder’s account is subject to an internal reconciliation process by the issuer bank. If the funds have not been credited to the cardholder’s account, he/she may be advised to approach the issuing bank customer care or escalate appropriately within the issuing bank for resolution. If there is still no resolution, cardholder has the right to raise a dispute with the issuing bank. If any other amount is paid offline by the customer to the Authorized NEXA Dealer towards the price of the NEXA Model, Accessories or statutory requirement, then the customer has to claim the said amount offline from the Authorized NEXA Dealer and no online transaction shall be made in this regard. No changes and/or modification are allowed online for NEXA MODELS after the Booking has been made. For any change/modification, the existing booking is supposed to be cancelled and the fresh booking is required to be made. MSIL reserves the right to amend these Terms and Conditions and may withdraw or discontinue the offer of online booking without prior notice. MSIL or the Authorized NEXA Dealer shall not be responsible for delay, loss or non-receipt of online booking information or any other form of submission not contemplated herein. MSIL reserves the right to change the variants, variant names and specifications at its own discretion and will make reasonable efforts to keep the Customer informed before the completion of the sales process. MSIL and its Authorized NEXA Dealership will not assume any liability of any inability or failure on their part in executing any order registered by any Customer on account of any causes, constituting a force majeure or otherwise, beyond their control. In case of any dispute, inconvenience or loss due to an act or omission of the Customer, the Customer agrees to indemnify MSIL and its Authorized NEXA Dealer. Any dispute relating to enforcement, interpretation or application of these terms and conditions shall be subject to Arbitration by single arbitrator appointed mutually by both the parties. The venue of Arbitration shall be at New Delhi. The Arbitration Proceedings shall be in accordance with the Arbitration and Conciliation Act, 1996 and its allied rules as amended from time to time. The Parties submit to the exclusive jurisdiction of the courts at New Delhi. The Agreement shall be governed by the laws as applicable in India. MSIL reserves the right to alter any terms and conditions or the process itself clause at its sole discretion as and when considered necessary. Reasonable efforts will be made to keep Customer informed of such changes. 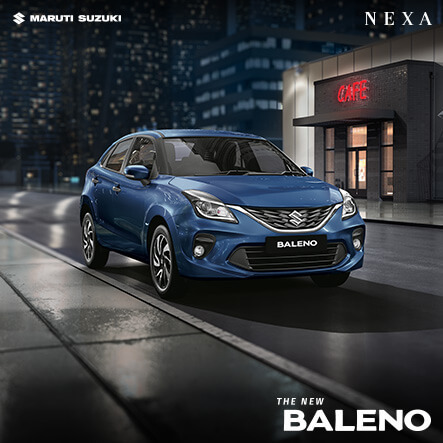 By Booking online via the NEXA Website, the Customer accepts and agrees to the above terms and conditions and also gives his unconditional consent for being contacted for Maruti Suzuki Products/Services over your telephone/mobile phone/email/sms. Non-acceptance of any of these terms and conditions will result in disqualification. The booking using this online facility is optional. NEXA MODELS can be booked and purchased without booking from the NEXA Website as well. The offer to purchase NEXA MODELS subject to these terms and conditions is optional and the customer may choose not to book the NEXA MODELS in response to the offer. MSIL, its Directors, Employees, Authorized NEXA Dealers, Consultants assume no liability whatsoever for any direct or indirect loss or damage arising from a Customer’s applying for purchase of NEXA MODELS as per the Terms and Conditions. The Booking amount paid by the Customer shall be adjusted against the Purchase price of NEXA MODELS at the time of invoicing. Pursuant to the booking, the Customer will be contacted by the assigned Relationship Manager at the earliest.